There is no doubt, we can flip NY 19 and other “purple” districts and roll back this administration’s agenda. New York’s 19th district representative, John Faso votes with Trump 86% of the time. He refuses to hold genuine public Town Halls. He’s not helping this district or listening to his constituents. Help NY19 vote blue in 2018! Faso voted in favor of repealing the Affordable Care Act. Faso also sought to cut federal healthcare funding which disproportionately impacted children and low-income families in his own district. John Faso voted to ban abortions after 20 weeks — even though abortion that late in term is both rare, and nearly always because the fetus has a catastrophic ailment. Faso failed to fight pesticide deregulation that negatively impacts local agriculture and endangers families in rural areas. Faso voted to strip workers of the right to overtime pay, allowing employers to offer comp time in lieu of overtime wages with delayed and vague guarantees of compensation. right to seek compensation for not getting equal pay. 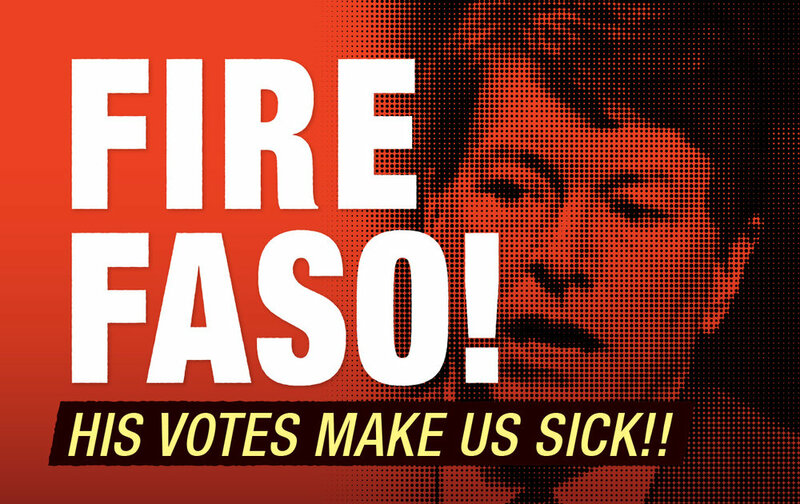 Faso has done absolutely nothing to encourage job growth in NY19. Faso voted in favor of anyone from an “open carry” state having the right to come to New York and brandish weapons—with their state laws overriding our own. Police nationwide oppose the bill because they fear will endanger police as well as citizens. Faso voted for legislation allowing people with serious mental impairments to access firearms. Faso has an A rating from the National Rifle Association, and receives funding from them. Indivisible groups across the country are working to keep their members of congress accountable, and to replace them when necessary. 86 percent (yes, really!) of calls to members of Congress were made by women. 70 percent of Indivisible group members, and the majority of group leaders, are women. In a recent TIME magazine cover story, the focus was on Indivisible, and how its grass-roots strength comes from women organizers and female candidates fed up with the status quo, ready to take on entrenched men in power. We will not let them steal our future. JOIN US AT NY19VOTES AS WE MOBILIZE TO WIN BACK NY19!